Bus cards could potentially be used in other means of transport including a taxi, ferry, street cars.To get the ride in the bus, street car, subway, ferry or to use other means of mass transportation you have to have money or proper ticket in your pocket. Everybody using mass transportation system knows frustrations of lineups, lost tickets, expired tickets, no enough change in the pocket, hustle when trying to pay to the driver, get change back, move forward. CXJ’S bus cards are small, they fit everybody’s pocket and very secure, can’t be read, copied, manipulated with, counterfeited, duplicated.Our company have signed a long term agreement with Iranian Government for producing Bus cards . 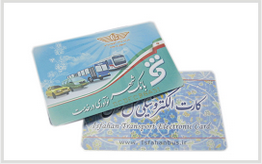 From Oct 2009 We produce bus M1 cards for Iran , we offer 400.000pcs cards per year Which marked we have developed Middle east Asia market successfully . They have visited our factory and satisfied with our quality and production capacity .Both of us are confidence with our long business cooperation.